CLASSES: Classes will include improvisation, voice & movement, non-gender ballet, spontaneous choreography, sensory experience, feldenkrais method, meditation, performative practices and bodywork. Teachers: Hadar Ahuvia, Maximilian Balduzzi, Maggie Bennett, Lorene Bouboushian, Ethan Cowan, Carly Czach, Liliana Dirks-Goodman, Melanie Maar, Juliana May, Steve May, Rebeca Medina, niall noel, Sari Nordman, Marissa Perel, Katy Pyle, Jen Rosenblit, Michele Torino, and Larissa Velez-Jackson. DINNER & DISCUSSION: Monthly panel discussions organized by writers Buck Wanner, Siobhan Burke, and Tara Willis followed by community dinners: guest chefs design a template, community fills in with side dishes. 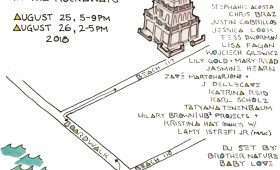 May 11: Jen Harmon, Yackez, Anna Azrieli, Tara Sheena and Kelly Moran, Steven Reker, Rebecca Davis, Lenora Champagne, 20:02 (melissa godoy nieto artist & topu lyo musician), Tyler Ashley, Marko Markovic, Kim Brandt, Tyler Matthew Oyer, Gillian Walsh, Billy Ferrer, Shizu Homma, Sam Roeck, Penelope Wendtlandt, Anna Marie Shogren. May 18: the A.O. Movement Collective + Matt Romein, Anna Adams Stark, Larissa Velez-Jackson, Molly Poerstel, Christen Clifford, Lindsey Weaving, Sophia Cleary, EmmaGrace Skove-Epes, Jodie Lyn-Kee-Chow, Susannah Simpson, Alexis Powell, Elke Luyten and Kira Alker, Grace Phelan, Allison Brainard, Tessa Wills, Mark Golamco, Kendra Portier/BANDportier, Hadley Smith, Lizzie Feidelson, Bessie McDonough-Thayer. May 25: Emily Wexler, Laura Bartczak, Kirsten Schnittker, Nora Stephens, Michael DiPietro & Friends, Jaamil Olawale Kosoko, Elspeth Walker, The Space We Make, Marin Sander-Holzman, Matt Romein and Sophie Sotsky, Sophie Bromberg, Kanene Holder, Megan Harrold, Lorene Bouboushian, Sarah McSherry, Ephrat “Bounce” Asherie, Lauren Underwood. June 1: Jon Konkol, the A.O. Movement Collective, Emily Climer, Hadar Ahuvia, Althea Baird/SWARM, Michal Samama, Strauss Bourque, Nadia Tykulsker/Spark(edit) Arts, Marissa Perel, Stormy Budwig, Jessica Goldschmidt, Claire Johannes, the pharmacy project, Marina Libel, Macklin Kowal, Gillian Walsh, Ayano Elson, Tamara Johnson, Justin Cabrillos. June 8: Maggie Bennett, Asher Woodworth, Theo Koppel, Yanghee Lee, Melinda Ring, Clarinda Mac Low (video), Ryan David O’Byrne, Chris Tyler, Amity Jones, Lawrence Graham-Brown, Kaia Gilje and Paige Fredlund, Alex Franz Zehetbauer, Nicolas Norena, Meg Weeks, Eloise Deluca, Stacy Grossfield, Sophie Sotsky and Greta Hartenstein, Meta-fictional Movement: Melinda Buckwalter and Kent Alexander, Jessie Gold, Luke George, Matt Romein & Sophie Sotsky, Colectivo AM. MONTHLY MURALS: Painted Installations by visual artists in the garden level courtyard.